BIGGER THAN A BREAD BOX SKYPE TOUR: 100 schools in 100 days!!! I hereby announce my CRAZY PLAN. I am going to come and visit YOUR SCHOOL, via skype, and meet with your students. I plan to talk about being an author, writing for kids, revising and editing, my favorite books, and specifically– about how BIGGER THAN A BREAD BOX took me thirty years to write. I plan to read a little bit from the book, and field questions from interested students. THEN I plan to followup with students who might be interested in writing, or asking more questions, via email. To sweeten the deal, the wonderful Random House sales reps have offered to send a FREEEEEE advance copy to the first 30 people who schedule a skype visit with me! SO.. you want to join up? You want to hang out? You want to know… hhow does this work? Interested teachers and media specialists should email me:( laurelsnyder AT hotmail DOT com ) and use the subject line SKYPE VISIT! Then, I’ll email back, confirm a time and date, and send you my skype name. AND if you’re one of the first thirty requests, I’ll put you in touch with someone who can send you a book, to use in the classroom as you see fit www.otcsildenafil.net. First come first serve, but with 100 visits as my goal, I’ve got a lot of slots to fill. So let me know how I can best JOIN YOUR CLASS! I’m deeply honored to be unveiling the following excerpt and interior art from BREADCRUMBS, the truly fantastic/lovely/compelling/heartbreaking new book by the wonderful Anne Ursu. I was sent a review copy of the book, and immediately began gushing about it on Goodreads, so Anne’s publicist offered to let me have a sneak peek of the art that wasn’t included in the ARC, to share with all of you lucky people. The book is a retelling of the Snow Queen, but it’s also a contemporary novel, about friendship and family, adoption and divorce, parents and kids. Anne’s writing is so clear, so poetic, I’m not going to set up this excerpt. I don’t think I need to. It’s a rare book that works at line-level, and is so compelling as language, one can’t help wanting to read it. The universe is a weird and magical place, people. She could feel nothing at first but stillness. Her body did not know what to do with it. The tick tock of the clock was gone, and Hazel missed it like her own heartbeat. Hazel shuddered as the wind danced around her gently, as if this was all there had ever been between them. She wiped the snow from her eyes, and it fell agreeably away. And she looked up. She was standing in the middle of a vast plain in the snow-shimmer night. All around her was still. There was an eternity of sky above her. There was no sign of anything else—the woods, the hills, the storm. The horizon stretched on around her. But she was not alone. There was a palace just ahead, sitting in the middle of the plain like a gift. It was simple— a small square with a dome framed by four minarets. It looked like it had been sculpted out of snow. Hazel stared at the palace. It was not the same. It was longer and a little more elegant and more feminine. 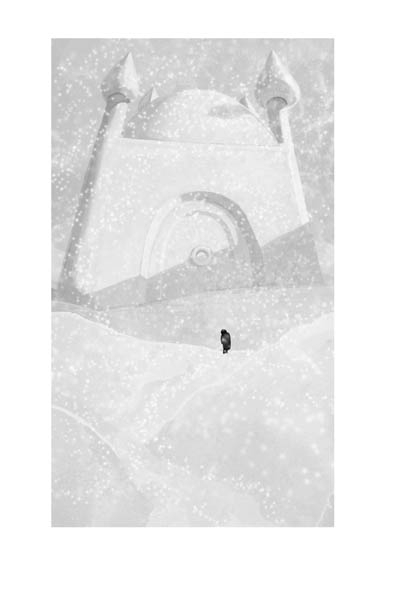 But it reminded her of the fortress in Jack’s sketchbook, of the place where no one could ever find him. It was like this plain had birthed it, just for Jack, and now it presided proudly over this kingdom of nothing. The glimmering palace tugged at her, and Hazel gave herself to it, even though she was nothing. She was a lamentable splotch, her black hair and brown skin and green shirt and blue jeans and purple backpack a speck in this eternal whiteness. Tell me you don’t want to read this book…. An email from a certain maternal figure arrived today, asking me whether “we have any news” about Bigger than a Bread Box yet. And we do! Not a ton, because it’s early yet. But reviews are starting to trickle in. So far they are VERY GOOD! So here you are, MOM! The discoveries Rebecca makes about herself and her relationship with her parents are achingly authentic. 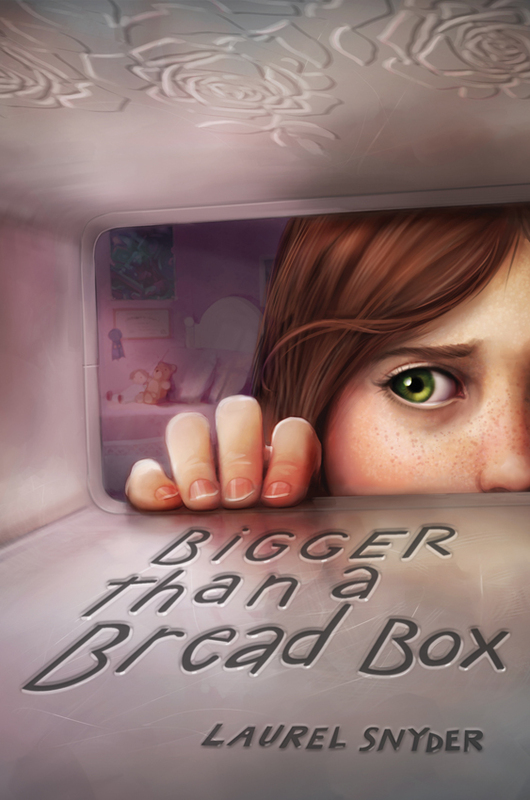 While the bread box provides a nice infusion of fantasy, this tale is as much focused on Rebecca’s maturing understanding of her family’s problems as it is on magic. Her appealing first-person narration rings true, and the characters around her are also believably portrayed, creating a tight tale with broad appeal. Introspective and rich with delicate imagery, this coming-of-age tale shares themes with Snyder’s Penny Dreadful (2010). The insightful, memorable, and complex characters that Snyder creates result in a story with the same qualities. The book is also showing up on some interesting lists. Here and there. Not that in any rational way one can think about such things, (but this is for my mom, remember, and moms like to get prematurely proud and kvell). Also, the book is just now turning up at various blogs around the kidlitosphere. And I did an superfun podcast interview about it too! We still have almost 3 months to go, so I don’t want to pelt everyone from here on out. But for those of you who love me and wonder (MOM) there you go! And if anyone has ideas for interesting Bread Box shwag, I’d love to hear it. Or brilliant thoughts of fun ways to do contests and giveaways. Or if anyone wants to make me a book trailer. Or send me a present or something. You know where to find me, MOM! And, as always, you can add it to your Goodreads if you’re into that sort of thing, and maybe let your local librarian or booksseler know you’d like to see it on the shelves! You are currently browsing the Laurel Snyder blog archives for July, 2011.